Some twelve months after the German Occupation Brian Edward Torode opened his kind smiling eyes to behold his native Guernsey for the first time. His father’s family was one of the oldest on the island – tracing back to Viking invasion – and Brian would delight in researching these ancestors. Only last year he was thrilled to pick out the figure of Thorold, the poet and tutor of William the Conqueror, on a visit to see the Bayeux Tapestry. Brian’s maternal grandparents had come to Guernsey from Jersey. His great grandfather hailed from the village of Gorges in La Manche and his great grandmother had cracked stone in the quarries of Lithaire. Even as a child Brian had a mischievous streak. Having escaped with a friend after curfew he was ‘chased’ by a German soldier, slipped on some steps, and cut his chin. The soldier later gave him his first taste of chocolate because he had been so brave enduring the stitches without anaesthetic. That same courage has been demonstrated once again in his final illness. Many of you will be aware that today is St Joseph’s Day and our friend Brian had a great devotion to St Joseph. The statue in the south aisle actually belonged to him. Why this affection for St Joseph? Well he certainly loved his own father Eddie but it was the nuns who ran St Joseph’s Catholic School in St Peter Port who were entrusted with his infant education. Later Brian progressed to the French School of Notre Dame but even at Infant School prayers, Mass, Rosary and processions were very much part of school life. His Grandfather was a Methodist lay-preacher and his Gran a staunch Methodist too. She idolised Brian – they were soul mates – and she ensured that her Brian would have a wider Christian experience than he was receiving at the hands of those Catholic nuns. So whilst on one hand playing at Mass with his school chums up in the attic at home, using the model altar loaned to favoured altar servers, he was then off, from the age of five, to his Chapel Sunday School where he received countless prizes for his knowledge of scripture. Ferreting through his things I have discovered that Brian had another birthday – 7th November. O n that day in 1953 he received the Lord Jesus into his heart and prayed that he might become a good soldier of Jesus Christ. Brian won a scholarship to Elizabeth College, St Peter Port, and enrolled as a day boy. He soon excelled as a linguist. It may have been a help, but more likely a hindrance, that his father’s family spoke the island’s patois, Guernesiais. The nuns were probably saddened when he moved out of their sphere of influence because they undoubtedly detected the beginnings of a priestly vocation. At Elizabeth College Brian attended the Town Church where he had been baptised and was confirmed and where increasingly he came to value Anglican worship and spirituality. As he moved into his late teens he also became involved with the island’s Anglo-Catholic parish – St Stephen’s – serving High Mass – but still attending Notre Dame and his Chapel Sunday school. In later life Brian was a close friend of the island’s French priest, Pere Lecluze. Clearly Brian flourished at school and he thought that he might become an Anglican Priest. He and a friend spent the inside of a week with Tubby Clayton at All Hallows in London so as to see what the ‘English Church’ was like. However, he chose to look elsewhere. His school’s military connections led him to try for officer training at Sandhurst but he wasn’t offered a place – he used to say “I think it was because I played Hockey and not Rugby”. Instead he decided to teach and so he came to Cheltenham to St Paul’s Teachers’ Training College. Brian maintained that he was hopeless at geography and having seen a picture of Cheltenham Promenade he thought it must be by the sea. St Paul’s College was Evangelical in tradition and had an excellent name for Teacher Training. I have the impression that he absolutely loved his time at the old college and he remained a committed old student. He made many friends there, he had a rich social life and he was involved with C.U., S.C.M., he was College Chapel Sacristan and he sang in the choir. He nearly left to transfer to a theological college but was persuaded to hold fire. At the end of the second year he gained a scholarship and spent a year studying French at the University of Poitiers in Tours. Here he also established links with the Eglise Reformee. 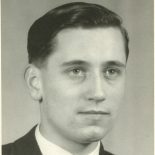 Brian gained a distinction at the end of his three years at St Paul’s – one of only nine of the hundred students who sat the Bristol University examination. His career began at Boldmere Secondary School in Sutton Coldfield teaching French to boys only a few years younger than himself. I think that these were sadder days – he missed his friends and I sense loneliness – lodging and working in alien suburbia. Within a short space of time Brian was back in Cheltenham teaching at Christchurch Junior School. He was happy again – living out in Prestbury and renewing friendships and church connections. From Christ Church he moved on in 1970 to become deputy head at Gloucester Road Primary School, supporting and befriending the head, James Lee-Smith. I think Brian would have liked to have succeeded his friend as Head but that was not the policy and so in 1982 he was appointed as Head of Elmfield County Junior School. Mr. Torode was a wonderful head even though he regretted the ties of administration and yearned to be back in the classroom with the kids. The children adored him, the teachers adored him and the parents adored him. His sense of humour would help to resolve difficulties and some of the situations he found himself in were far from easy. Brian loved his schools to be full of art and he loved his school plays – the first ‘Christopher Robin’ by A.A. Milne. Remember all those Roger Jones musicals. Finding good in every child, nurturing the gifts of all the pupils and staff, offering a secure and loving environment for the children, especially those who came from difficult backgrounds, laughter, encouragement and academic excellence were all important to him – not league tables and budgets and staring at a computer screen. Brian had a wonderful way with everyone and this would come together on Fete days and harvests and all those fun assemblies with Mr. Torode. He served as President of Cheltenham N.U.T. and in 1993 he was elected a Fellow of the College of Preceptors. Three years later he finished at Elmfield having completed thirty-six years with Gloucestershire Education Service. Brian’s Farewell and retirement – what a sad but wonderful day! In a typical Torode manner he sat on the stage steps holding us all captivated and then he posed for us on his shiny blue Canterbury bike. As we know his involvement with education continued as a Tutor of Trainee Teachers at the University of Gloucestershire, the School Arts Committee, Governor of Gloucester Road School, Bishop’s Visitor to Schools, School Inspector, he served on SACRE, encouraged the new All Saints’ Academy and he kept in contact with the other heads in his old cluster. For a number of years now Brian has lived in Leckhampton but when I first met him, back in the very early 1980s, he was living in Kew Place, off the Bath Road, in the shadow of Cheltenham College, and he thrived in this friendly neighbourhood. What about St Stephen’s? Well he was involved here for nearly fifty years. He first attended on the recommendation of a parent and, in his own words, subsequently ‘did all the things an active churchman might do – sidesman, server, P.C.C., Churchwarden, Deanery Synod, Chairman of the Council of Churches, organizing retreats, quiet days and non-liturgical services’. Although a terrific head teacher and a passionate churchman, Brian would speak of that ‘I haven’t done what I should have done’ feeling welling up inside of him. After much prayer and conversation with Bishop John Yates and others he was selected for non stipendiary ministerial training on the Gloucester Course. This was pretty demanding for a busy head teacher – two three hour evenings per week, a residential weekend every month and two weeks away residential training each summer. But after three years he was made a Deacon with Richard Bryant at Tewkesbury Abbey on 3rd October 1993 and ordained Priest at Gloucester Cathedral on 2nd October 1994 with Helen Wood and others. Following ordination Father Brian was involved as a non-stipendiary priest serving St Stephen’s and St Philip and St James, Up Hatherley. Later he served in the United Benefice of St Stephen’s and Emmanuel and finally he was appointed non Stipendiary Associate Priest in the South Cheltenham Team Ministry with special responsibility for this church. Father Brian was a loved pastor, a moving preacher, an expert liturgist, he fed his parishioners on a rich diet of solid teaching, parties and events, he loved every stone of St Stephen’s and over the years reached out to so many people who pushed open its door. He loved to take people out and about on pilgrimage or to a special service and he would arrange meticulously every detail of the programme. But there is far more to Brian Torode than school and church. There was also his passion for local studies. It started before I knew him. I once rescued from the dustbin his college dissertation on the Parish of Southam de la Bere. Then came his excellent guide book of St Stephen’s Church. Back in the 1980s the centenary celebrations here resulted in further research and displays. One evening we were returning from an ecumenical service at St Gregory’s when we noticed that the roof lantern of the synagogue was glowing with light. Moments later we found ourselves inside and, as a result of a meeting with Henry Bazaar and Barry Green, Brian began his research into the history of the Cheltenham Hebrew Congregation. So much was to flow from that meeting: warm friendships with Barry Green and Michael Webber, three editions of his book, a lecture to the International Conference on Jewish Genealogy in 2001 and loads of talks and visits to Synagogue Lane. Brian was so proud to be invited to meet the Chief Rabbi when he came to Cheltenham, he was thrilled to be conferred with the title of an Honorary Friend of the Cheltenham Hebrew Congregation and each year to be so involved with marking National Holocaust Memorial Day. Ten years ago Brian was engaged in painstaking research into the life of the architect John Middleton which resulted in his fascinating and enduring study. His local studies extended to the local architect William Hill Knight, as well as Tivoli, the Cheltenham Masters of Ceremonies and other topics. He was a committee member of Cheltenham Local History Society and gave many of his talks to raise funds for a medical charity. His hours of relaxation were absorbed in researching local saints, holy wells, the Oxford Movement, Anglican religious communities, Father Ignatius of Llanthony, his own family, he was passionate about building conservation and eagerly promoted the Historic Buildings Open Days. He was a co-founder of the Gloucestershire Catholic History Society and belonged to an array of national organizations. Amongst his ordination cards he kept words from long ago written by Bishop Ken. These I have reproduced for you on his prayer card as they clearly inspired his ministry. Brian always had high principles; he was a man of tremendous integrity and warmth. He never lost his enthusiasm, his kindness, his playfulness, his wisdom and his intelligence. Indeed Brian was a much loved teacher, priest and scholar and I for one am proud to have been his friend.